Shovel Knight's 2.2 Update is now live on Wii U and 3DS in US! It was just released so if you had trouble before then give it another try! Shovel Knight’s 2.2 patch also encompasses the 2.1 update, which adds amiibo support. Europe has had access to 2.1 since December while North America has been at 2.0 until today. You can find the notes for the two latest updates after the break. Adjustment: Swapped the design of two rooms within the Plains of Passage while playing as Plague Knight. Adjustment: Important: Game-Changer: Megaton: Can now stand on the roof of all houses in the Village. Fix: The Iron Man 2014 Cheat is back in service! Just enter IM&SGC14 on the profile screen to compete for the highest score in The Lost City. Plague Knight can now take on this challenge with the help of his Treasure Trappings! Fix: Uncollected Cipher Coins revaled from dirt blocks not re-appearing if moving to a different screen before collecting. Fix: Reize will drop song scroll center screen if he ends up too far to the screen edge. Fix: Mr. Hat sometimes appearing off his mark during Plague Knight’s post-credits. Fix: Smoke bomb and Treasure Knight chest capture bug. Fix: Stuck dancing at The Potionarium when using certain Cheats in Plague Knight’s campaign. Fix: Minor text improvements across all languages. New! Introducing the Shovel Knight amiibo! Scan the Shovel Knight amiibo to activate co-op, Custom Knight, and new Challenge Mode Challenges. For instructions, check out the manual. New! 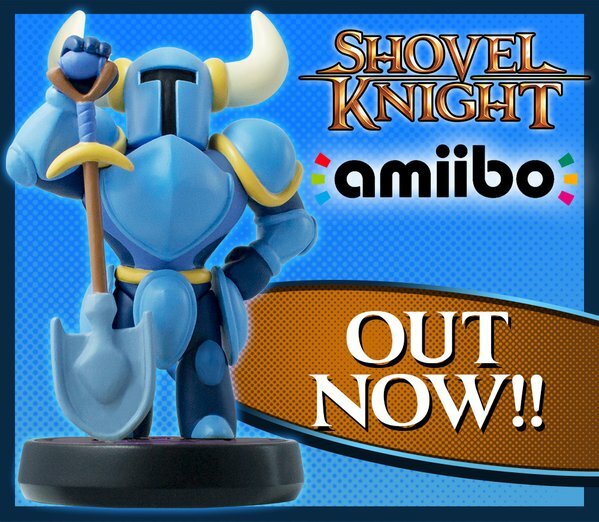 Introducing the Shovel Knight amiibo! Scan the Shovel Knight amiibo to activate Custom Knight, and new Challenge Mode Challenges. For instructions, check out the manual. New: ZL and ZR buttons can now be bound when playing on a New Nintendo 3DS. New: [Plague] Mail Minion will now read a letter to you which includes all sorts of neat stats. New: [Plague] Minion can now appear within Plains of Passage to explain how to perform a bomb burst in case you’re stuck! Adjustment: [Plague] vs Propeller Knight has been tuned to be less difficult. Adjustment: [Plague] Alchemy menu is slightly faster to open, close, and select items. Fix: [Plague] Lock up when defeating Mole Knight when Mole Knight is hiding in the wall. Fix: [Plague] Health display inconsistencies when upgrading health while maxed out on health tonics. Fix: [Plague] Platters dropping incorrect health, magic, and tonics during Tower 2’s Banquet Battle. Fix: Player can collect pickups while in chest open surprise animation. 3DS & Wii U: [Plague] Relic heap icons appear on the touch screen now too! 3DS: Crash when viewing Plague Knight Feats in German while stereoscopic 3D is enabled. 3DS and Wii U: [Plague] Fixed crash (and made other improvements) when using relic quick and arcana touch menu at the same time.